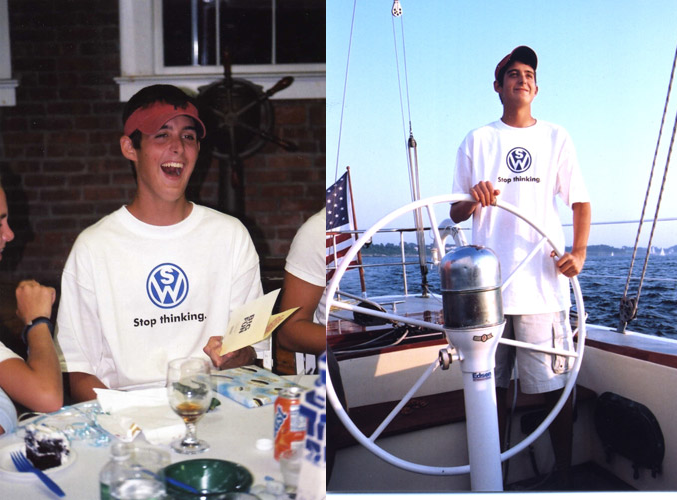 The CJ Buckley Regatta was started by CJ’s teammates at Greenwich Bay Sailing Association in 2003, the summer after he lost a valiant 16 month battle against brain cancer. The regatta, which will celebrate its 16th Anniversary this year, continues to honor his courage, spirit and determination and his passion for team racing. CJ was very special. He was a talented sailor and a fierce competitor at GBSA and Tabor Academy. He was partial to team racing- the challenge, the strategy and the excitement-like a game of chess on the Water. He was diagnosed with the unthinkable two days after winning a regatta and two weeks before his 16″ birthday. The CJ Regatta is unique in many respects. The mission has always been to inspire and to provide a memorable learning experience for participants. The nominal registration fee is used to generate revenue for the Scholarship fund which provides financial assistance to deserving young sailors who demonstrate the ability and the desire to embrace the sport. The aid grant can be renewed annually until age 18. Many recipients have gone on to sail at the College and international levels and to become Coaches and program directors. The regatta has been run entirely by volunteers – over 75 strong – including many of CJ’s former mates and their families, who return to Goddard Memorial State Park year after year, to lend their help and support. The regatta has been successful, in large part, because of the dedication and enormous effort of Justin and Kyle Assad, who have led the event from the onset and who have mobilized an experienced crew of coaches and umpires. Over the years, many traditions have been created including “flying” lunches, specially designed t-shirts, customized awards and reusable Water bottles, and team/candid photos. The website (www.cjbuckleyregatta.net) which is updated regularly, has a new look and is the window to online registration and social media. The regatta has grown from a small local race to the Club 420 Association’s National Junior Team Race Championship for the 9″ consecutive year. There are 24 teams with over 144 sailors and alternates who have come to this beautiful venue from across the Country (including New England, Annapolis, Florida, Chicago, Minnesota, California) and the Virgin Islands. There are two racing circles and more than 125 races are completed each day before the Gold Fleet finale on day two. Sportsmanship and camaraderie are essential features of the regatta. The short video on the regatta website, produced by Providence Pictures and edited by Manya Glassman in 2015, used GoPro Cameras to capture the essence of the event and the joy of the participants. The images give true meaning to CJ’s motto: “Sailing is life – the rest is just details”. The regatta is entirely dependent on the commitment, generosity and enormous effort of everyone involved. Volunteers, donors, sponsors and visitors all play an essential role in ensuring the continuation of the event and the preservation of its legacy. In light of this year’s 17th Anniversary, contributions are being Solicited for the CJ Buckley Regatta and Sailing Foundation to sustain its commitment to aspiring young Sailors.